Both are ancient crafts. The Worshipful Company of Saddlers and the Worshipful Company of Farriers attained their status centuries ago and are recognised today as two medieval crafts that still flourish. Strong toolbox and spare tools. Shoes made for the horses on each day’s round. Various grades of files for rasping rough edges. Pincers to trim hooves, remove old shoes. Basic first aid for horses feet. As most farriers start work early and spend each day away from their forge/home, they also take food and drinks for themselves and their dogs! Mobile telephones are useful, to let clients’ know if they’re running late, or to take emergency calls. During a routine shoeing the farrier checks the horses legs and feet for signs of injury or disease. The old shoes are removed and any signs of unusual wear on them noted. If hot shoeing, the mobile forge will be fired up and the new shoes adjusted, where necessary, to fit the horse’s foot (never the other way round.) Hooves are trimmed appropriately and the delicate inside of the foot cleaned and inspected before fitting the new, hot, shoes. A final filing of rough edges and the job is finished. 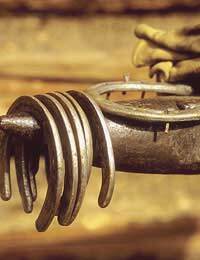 Nails are tapped into place with skill and extreme care, no matter how experienced the farrier, otherwise damage could cause the horse suffering or even loss of use. Ideally a horse will stand still and support itself while the farrier works. However, there are times when horses do everything but, which is why farriers need to be patient and physically fit! There is only one way to register with the Farriers Registration Council and that is by taking a 4-year apprenticeship with an approved farrier. Saddlers also make bridles, harnesses and with further product knowledge, other leather goods, too. Most of the work is done by hand so it is important that they are good at working with their hands. Close attention to detail is necessary with this work (consider how small and neat the stitching is on quality tack) and excellent eyesight, imperative. Saddlers need to enjoy working with horses and have an understanding of the equestrian Trade. An artistic flair helps, as the saddlers work is a rural craft, with scope for personal development in design. Patience is an absolute must because the intricacies of making a saddle takes days and requires a lot of sitting in one position for long periods. Most saddlers wear protective clothing and are aware that they need to work with strong smells like polishes, preservatives and glues. To make sure that every saddle is correct, saddlers usually offer a fitting service with new saddles and a re-flocking when the stuffing of a new saddle has settled with use. Horses and people come in all shapes and sizes. It takes skill to measure, make and fit a saddle that will help the rider to sit in a good position, without impeding the horse’s movement at all. Both horse and rider must be comfortable with the saddles they use. Each saddle is designed with the two main points of the rider’s seat and the horse’s freedom of movement in mind. Some of the tools used by saddlers are based on traditional ancient designs and include: knives for cutting leather, races to cut grooves, smashers to smooth stuffed areas of saddles that wrinkle, awls for marking and stabbing out holes in the leather, needles varying in size from 55 mm to 62 mm, hole punchers, hammers and trimming tools. There are no formal entry qualifications needed to study as a saddler, but there is a 4-year apprenticeship for the resulting qualification of Master Saddler. Places are few and far between.